The Guinness Open Gate Brewery & Barrel House in Baltimore County is the first active Guinness brewery in the U.S. since 1954. WASHINGTON — As small-craft brewers fill up the nation’s premium beer market, a 258-year-old big dog is set to make a sizable splash. 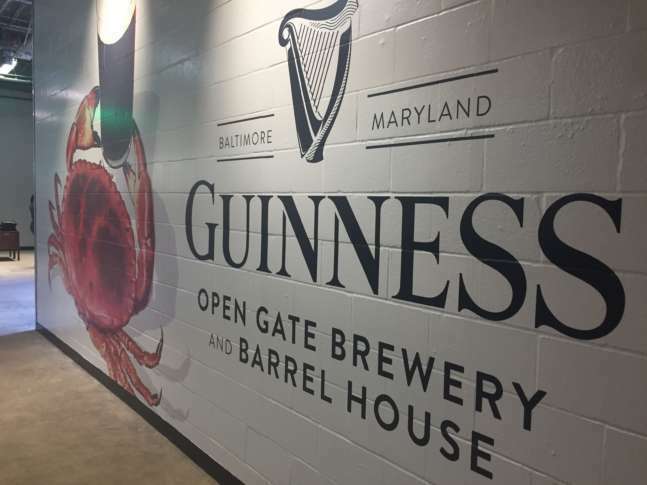 Guinness opens the doors Friday to its test taproom in Halethorpe, Maryland, offering a taste of what will be the Guinness Open Gate Brewery & Barrel House. The brewery and visitors center is the first active Guinness brewery in the U.S. since 1954 and will produce over a million cases annually when it’s complete. The facility (5001 Washington Blvd.) had an earlier life as the Calvert Distillery, a Seagram’s bottling plant. The refurbished plant will be the new home of Guinness American Blonde Lager and any new beers developed for the U.S. market. And regarding those new brews: The new taproom (open Friday–Sunday) will feature test beers developed in a new small-batch experimental brewery. At the helm are two big names in craft brewing: Peter Wiens (formerly “brewmaster East Coast” for Stone Brewing Co.) and Hollie Stephenson (formerly head brewer at Highland Brewing Co.). Collaborations with other nearby breweries, such as nearby Heavy Seas, are possible as well. “We’ve already had a slew of conversations,” said Andrew Beebe, the head of Open Gate Brewery and Barrel House. At Thursday’s media event, the beer menu included two blondes as well as an American IPA. Fashioned after Guinness’s famous Open Gate Brewery in Dublin, the new facility is expected to draw 250,000 visitors annually. It creates 40 brewing, warehousing and packaging jobs and over 100 hospitality jobs. The full facility is set to open in spring/summer of 2018.